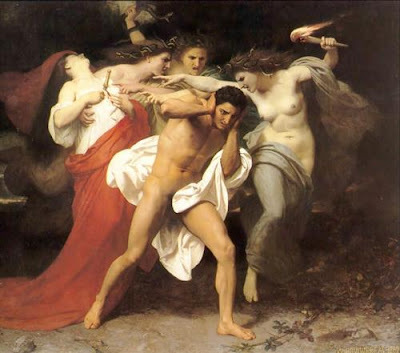 Time passes and Orestes arrives at the Temple of Apollo at Delphi, still pursued by the Furies. 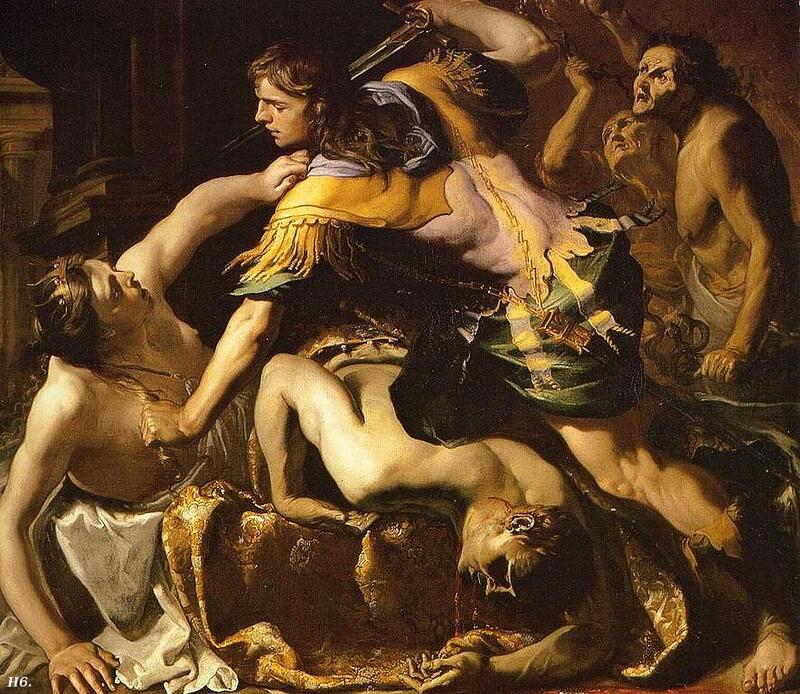 His conflict continues in tormenting unrelief and he appeals to Apollo for alleviation from his guilt. He has avenged his father, but in doing so has murdered his mother. Divine command has clashed with divine decree, and he is helpless to navigate his way through the maze of paradoxical possibilities. The priestess, Pythia, is shocked to find him in the suppliant’s chair with a sword dripping with blood and the sleeping Furies surrounding him. A spell has been placed upon them by Apollo so Orestes can travel unhampered to Athens, which he does after Apollo absolves him of complicity in his murder of Clytaemestra. But now he must seek Athena for a possible resolution to his dilemma. Yet the ghost of Clytemnestra awakens the Furies and they pursue their prey to Athens, where Orestes is suppliant, and at the Aeropagus the goddess Athena must intervene with a jury of men to pronounce sentence upon the tormented man. 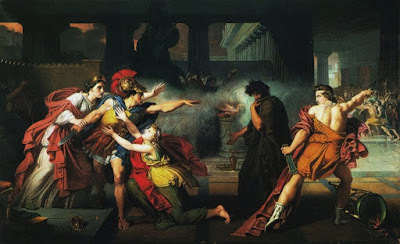 Immediately Apollo is set up as Orestes’ defence, while the Furies appear as the prosecution in support of Clytaemestra’s ghost, yet in the end, by a tally of votes, Orestes is acquitted. This play is perhaps the most complex and difficult of the trilogy. 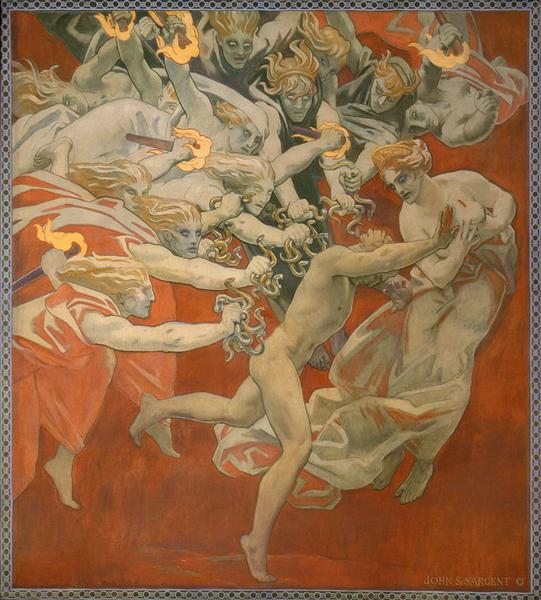 The Furies are older than both Apollo and Athena, and it is thought that they symbolize the old pre-democratic system of ancient Greece. Their childish simplicity of pre-Hellenic times clashes with the more sophisticated Hellenism of Apollo, where reason, intellect and civility are emphasized; to the Furies, the reason why Orestes has blood on his hands is unimportant, only that it is there. Yet while Apollo’s reasoning is more refined, his advice and actions echo a similar cruelty to his counterparts. Athena must intervene, reconciling man to woman, traditional to modern, and barbarism to culture. 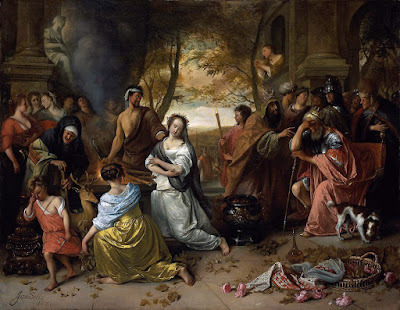 To do this she surprisingly convenes a Jury of Athenian men, effectively entrusting the burden of judgement and the transformation to a more equitable society onto the shoulders of men, deeming certain situations and conflicts too complex to be judged by one individual. In this case, we do no know if the jury has an odd or even number of members, and these numbers do affect our interpretation, as the votes are balanced and for a decision, Athena’s vote is required. Did she break a tie or did she make one? In either case, Orestes is acquitted but what is the implication of each scenario? 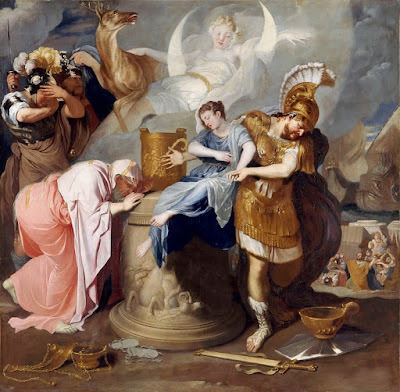 If Athena’s vote was needed to break a tie, it is implied that human justice still cannot resolve the dilemma; in the later case, it would appear humans are still drawn to the old ways and her vote is needed to push them towards a new order. In either case, the gods are still necessary. At the point of writing the play, the Greeks had a court system in place, but Aeschylus back-dates it into myth to weave together the old justice system with the new. The Aeropagus council dominated Athenian government in the 6th century, but by 5th century their powers were curtailed, during the reforms of 462. It is thought that Aeschylus’ trilogy was addressing these reforms, however, there is dissension among scholars over whether he is admonishing the reformers for not respecting the old system or stressing its importance. 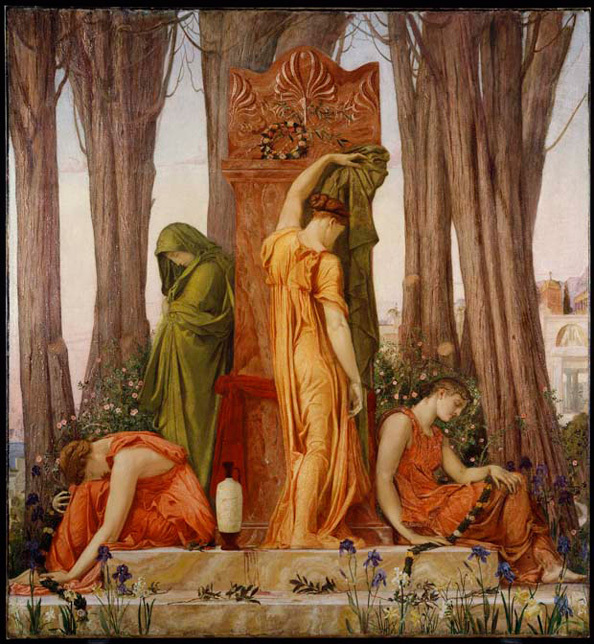 In The Eumenides, the Furies are not discarded, rather they are absorbed by the new order and changed into ‘the kindly ones’. 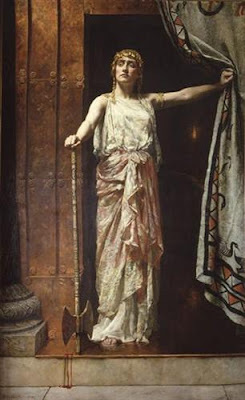 I’ll move on to Sophocles next, but I think I might read Electra first, as she played a significant role in this trilogy, and Euripides also wrote a play about her, linking the three playwrights around a specific subject. Originally thought to be the earliest extant Greek tragedy, having been produced in 490 B.C., more recent evidence places it with a trilogy produced in 470 B.C., making it one of Aeschylus’ later plays. 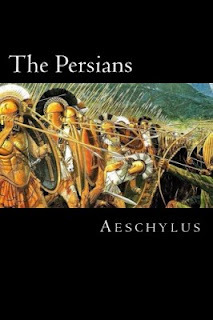 More primitive in style than The Persians, and using the archaic practice of having the protagonist as the chorus, it’s possible that Aeschylus kept it unseen for 20 years, but his motivation for this concealment would certainly be inexplicable. 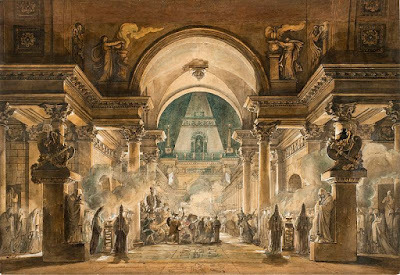 The play begins with the chorus of the fifty daughters of Danaus, having recently landed in Argos after fleeing Egypt, pleading with Zeus for his favour. In Homer’s, The Odyssey (Book IX), Zeus is referred to as the protector of suppliants, and in the maidens’ case, their Egyptian cousins have proposed marriage and, rather than submit, they chose to escape to the land of their ancestors. As the maidens hold white olive branches over an altar, their father, Danaus, gives them instructions as to which gods to invoke for help for their protection. He muses that unwilling wives could not possibly be considered pure, and instructs his daughters to allow their behaviour to be guided by modesty. Pelasgus, King of Argos, arrives with a contingent, and questions the strangers, remarking on their barbaric appearance. Seeing the altar, his puzzlement is apparent as to their knowledge of Argive ways. 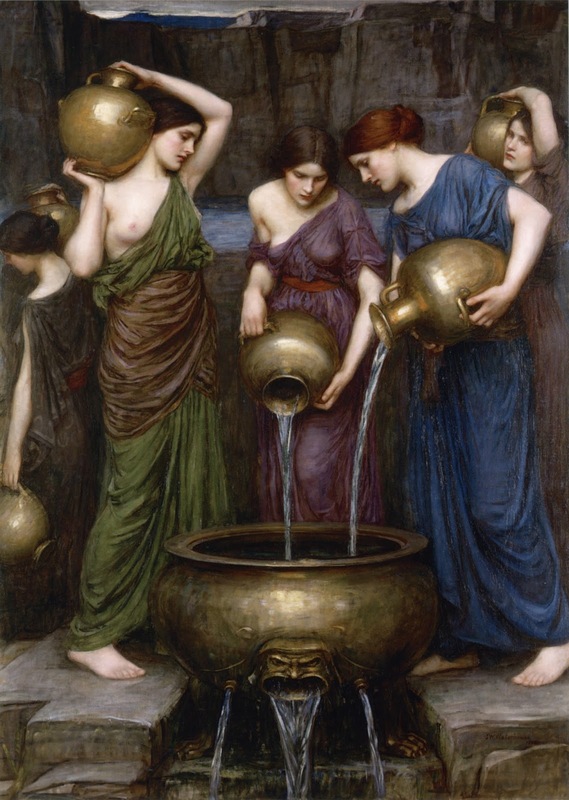 The maidens reveal that they are of Argive ancestry, descendents of Io who had been seduced by Zeus, transformed into a cow to hide her from his wife Hera who sent a gadfly to torment her, and so she wandered into Egypt. (see Ovid’s Metamorphosis Book I) In spite of the importance of kinship, Pelasgus hesitates, finally deciding to take this crucial question to the people (ah, a democracy!) in spite of the maidens’ pleas for his decision as king. “You are not suppliants at my own hearth. In common let the people work a cure. However, the question of the fate of these maidens is not so simple. 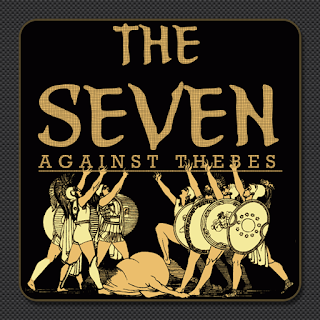 While they have no legal recourse to claim protection from the Argives, as suppliants they are invoking the protection of Zeus, and Pelasgus sympathizes with their plight. But if he grants them shelter, Egypt is likely to declare war and can he justify the blood of his people shed for strangers? His anxiety flows from his speeches. Pelasgus returns to the city with Danaus to discover the people’s will, but soon Danaus returns with happy tidings: the city has voted to protect the maidens with their lives, if necessary. 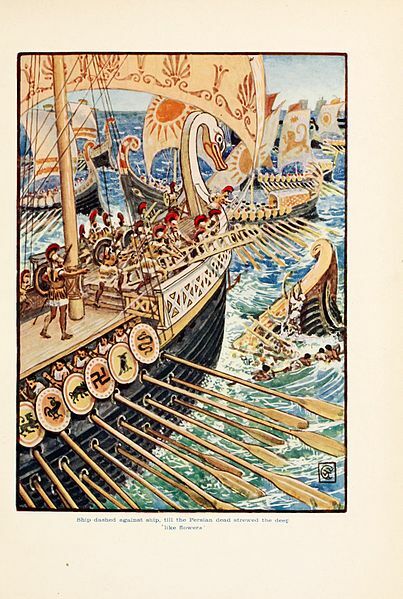 The suppliants offer prayers in favour of their honoured protectors until ships are spotted in the sea, and an herald of Egypt arrives on shore to bring them home. If they resist, they risk their own blood and decapitation. Thus begins an exchange between the herald and maidens that is a sparring of might and justice. 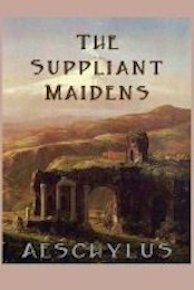 The maidens are not only struggling physically with their captors, but intellectually as well. And strength may he assign us. To the maidens, prayers and justice are paramount when considering their freedom. While this play certainly appears more archaic than The Persians, on the other hand, it is more intricate due to the moral and political questions that are brought to the surface and wrestled with quite effectively by King Pelasgus. It reminded me a little of Sophocles’ play, Antigone (which I haven’t reviewed yet, but will eventually) where there is a question of mortal or divine right over political or societal right. 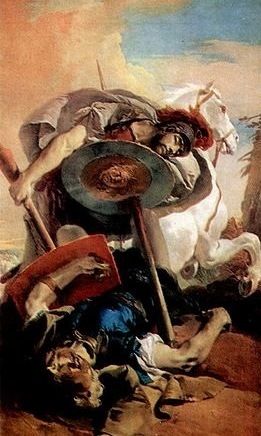 Does Pelasgus risk war in his kingdom and possibly watch his own people die, all for fifty foreigners with a tenuous connection to the land? 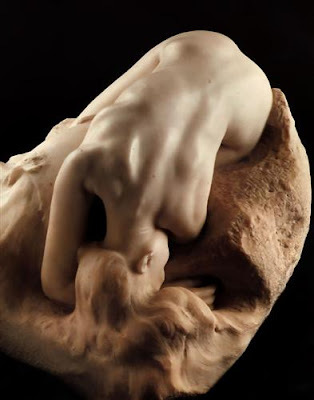 Or is there a bigger question: is freedom and human dignity more important than life itself? Are preserving the importance of these ideas something that go beyond our human existence? 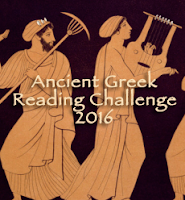 It’s a powerful question and Aeschylus deals with it quite compellingly. I quite like the presentation of King Pelagus, not as a powerful, dictatorial king, but as a leader who is truly concerned with what is best for his people. His mental struggle is defined by his desire to make a just decision, not simply a lawful one. Yet he doesn’t freely throw law out the window, and his impassioned agony of choice is very compelling as he resolves to defer to the will of the people. Yet when the Egyptians land, he is strong in his stand for what has been legally decreed, and zealously defends the maidens’ personal decision. 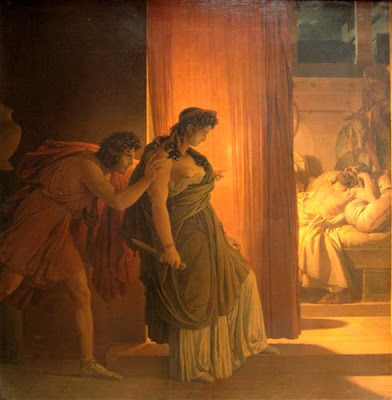 His behaviour is parallel with King Theseus in Oedipus at Colonus where he is faced with a problem, struggles with it, yet despite possible negative ramifications, is determined to act in a just manner. This play was somewhat difficult because of the translation, which in this case is not the translator’s fault, as it is simply in a form that does not translate well into English. Whatever its perceived problems, this play held my rapt attention and has become one of my favourites in my growing list of Greek drama. 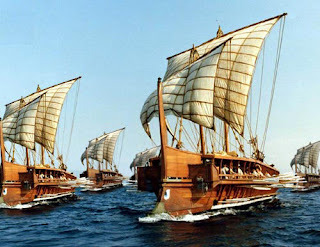 Performed in Athens in 472 B.C., The Persians portrays the naval battle at Salamis between the Greeks and the Persians, which occurred seven years earlier. 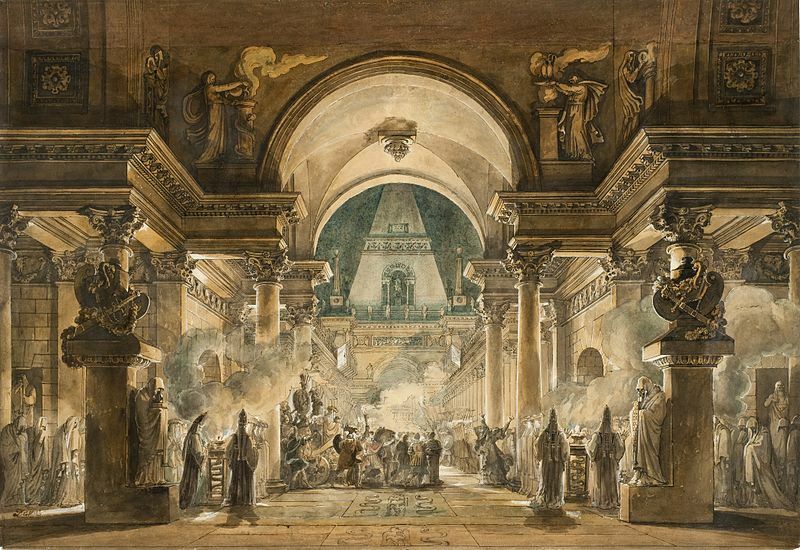 It is unique from other tragedies, as it was without a prologue or exudos (final scene) of the chorus. 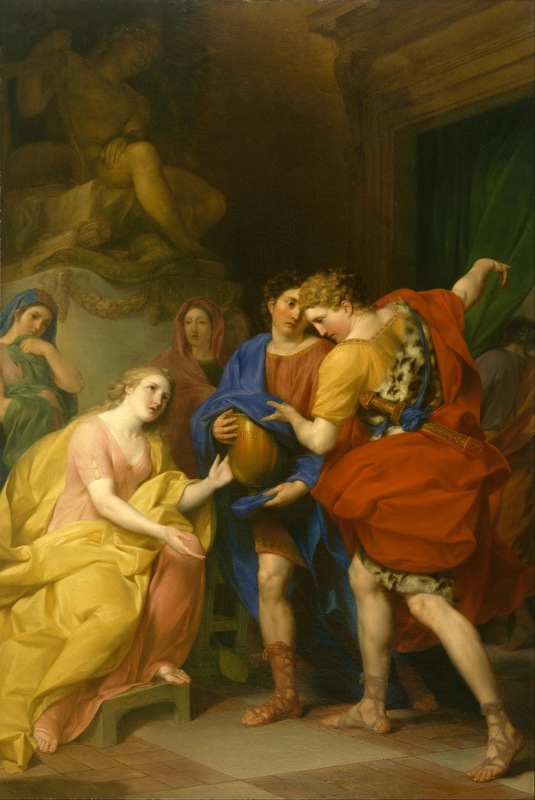 As it deals with contemporary history instead of the common mythic topics, it was not part of a unified triad of plays that Aeschylus appeared to favour, yet interestingly it was performed with two other “lost” mythic plays, Phineus and Glaucus Ponieus. In comparing this play to later tragedies, these differences raise the possibility of tragedy developing out of an earlier form. 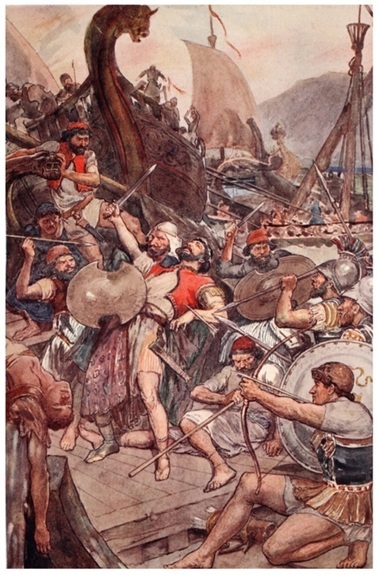 The herald, an eyewitness, bitterly describes the Persians’ defeat at Salamis. Momentarily speechless, the Queen finally asks about survivors. Xerxes is still living, but the Herald lists the many dead heroes, casualties of the battle. The survivors are scattered. Lamenting that her dream of defeat has come to fruition, the Queen attempts to assuage her grief by offering prayers and gifts to the gods. 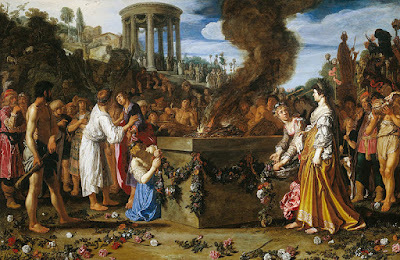 As she offers libations at the tomb of her dead husband, Darius, his ghost rises up, inquiring about the present woe. When he hears of the tragic defeat, he appears to blame his son’s “youthful pride”, yet he counsels the Queen to receive her son gently when he returns. Wow, this was a very powerful play. By the Persians’ defeat, Xerxes has not only lost honour for himself, but he is responsible for the loss of honour of generations before him. Yet the tragedy of the situation is in his overweening pride and his attempt to place himself in a position above the gods. He ignored the wisdom of his elders, instead choosing to go his own way, and paid dearly for his folly. Even though, Aeschylus was writing through Persians eyes, elements of a Greek mindset crept in here and there, as in Darius’ horror of the Persians plundering and burning the Greek temples. And he counsels the Queen for the Persians not to invade Greece because “the Grecian soil is their own ally.” Very convenient. Yet there is also a sympathetic tone towards the Persians, as if the Greeks can empathize with the sufferings of battle and the woes of the aftermath of loss. In fact, the sympathy is startling. The great daring of such a play perhaps goes beyond both historical and contemporary understanding. No playwright had risked presenting the enemy, not only from a sympathetic viewpoint, but also showing them as noble and heroic in battle. The battle at Salamis was a recent event and it is a tribute to the rhetoric of Aeschylus that this play was so well-regarded. 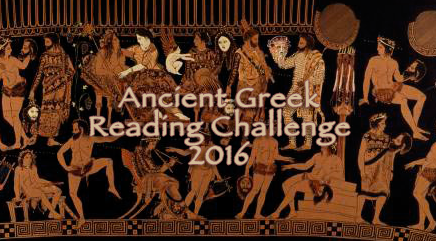 Yet while his feat is indeed admirable, Aeschylus ensures that he remains in control of his creation. Few names can be traced to real persons, hyperbole is employed and Persians adopt Greek tradition, preventing any person from drawing any concrete truth from his presentation. His Persian War, while being historically based, is still in the realm of myth, as if he cannot escape it.